Werner Construction crews have been stockpiling gravel for several weeks in preparation for the Highway 14 overlay project from Albion to Petersburg. 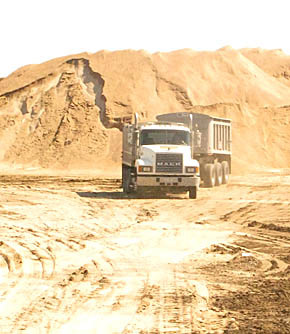 The gravel stockpiles and asphalt plant are located on the east side of the highway between Loretto and the Albion Airport. Josh Johnson, project foreman for Werner Construction, said the actual overlay work is expected to start today, Wednesday, Aug. 15, beginning initially at the plant site and progressing north to Petersburg.